The instrument used for casts 1-19, 24-30 and 35-66 was a Sea-Bird SBE911 plus. The instrument used for casts 20-23 and 31-34 was a Sea-Bird SBE25 Sealogger. As part of the Joint Oceanographic North Sea Data Acquisition Project (JONSDAP), a line of sample stations east of Orkney to the centre of the North Sea was established (1976). This section is commonly known as the JONSIS (Joint Oceanographic North Sea Information System) line and has been sampled annually over the past 30 years. Initially, there were only 10 stations 1-10, two further stations were added, 1a and 6a, in later years. At present Marine Scotland monitors this line three times a year: Sampling is usually conducted in April, September and December. These data provide information on long term variations in key variables. Monitoring data include: Ocean profiles of temperature, salinity and nutrients. Listed below are details of the standard hydrographic stations that form the JONSIS line (start Point on Orkney to the centre of the North Sea). 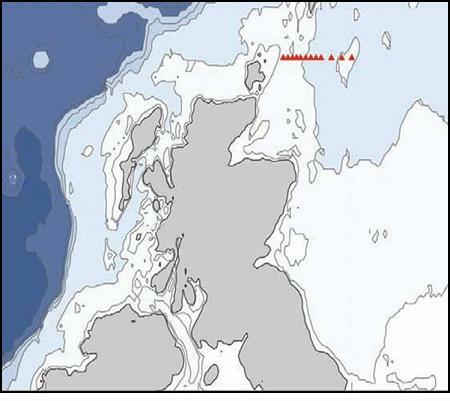 This transect is monitored by Marine Scotland.